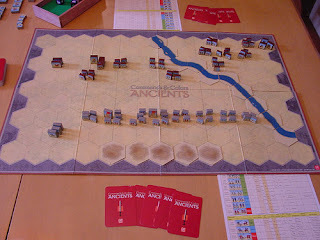 This medium war game for 2 field commanders mainly covers historical battles between Rome and Carthago. For all the different units simple wooden blocks with stickers are used, and when setting up an ancient battle with a lot of different units the look of the battlefield can be really impressive. The game comes in a big and heavy box. The gameboard itself is made of thin cardboard, which is basically okay - though a little bit more stability wouldn't have been bad. As I wrote before the units are represented by wooden blocks - more than 300, and it takes quite a time until you have fixed all the little stickers for infantry, cavalry, war machines, elephants and many more on the blocks. Nevertheless I have to say that I somehow liked doing this. At least you get a good overview which units are available. The battlefield is divided into three sections and for activating and moving units you have to use battle cards. At the beginning of each turn you choose a battle card which enables you to move some specific units and/or also declare combat (ranged combat and close combat is possbible, depending on the unit). After moving the blocks (one unit technically consists of 2 to 4 blocks) combat will be resolved, and this will be done by rolling dice. The system is simple and effective, although offering a lot of possibilities and strategies - especially if a leader unit is involved. Depending on the result of rolling dice one or more blocks will be removed, until finally a unit is completely defeated and the attacker earns a victory banner. Most scenarios are ending when one player has collected five (or more) victory banners. 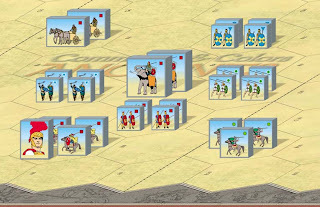 C&C is a lot of fun - beginning with setting up the armies as described in the scenario book (which prepares the right mood for the battle) you are constantly thinking about a proper strategy how to use your units as efficiently as possible. You definitely are dependent on luck, as on the one hand you need the right command cards (hand management is okay though) and on the other hand you need some luck when rolling the dice for resolving combat. But in my mind this mechanisms help to boost the tension especially at the end of the game, when shortly after one player had the chance to win, all of a sudden the situation can change and the opponent collects the final victory banner. So, it's a good mixture of strategy and dice rolling - and overall a lot of great battles. And as one scenario can be played in an hour, there is always the possibility to change sides and play again!! "Commands & Colors: Ancients depicts warfare from the Dawn of Military History (3000 BC) to the opening of the Middle Ages (400 AD). 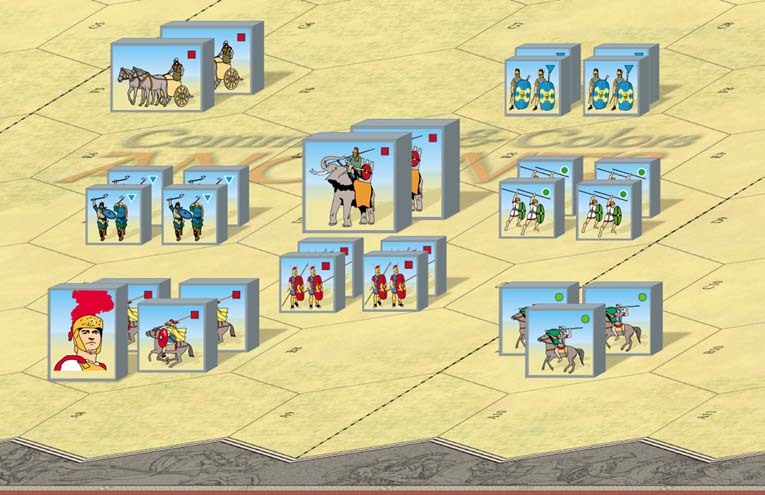 Quite an ambitious undertaking for one game, yet Commands & Colors by design is a unique historical game system which allows players to effectively portray stylized battles from this time in history. 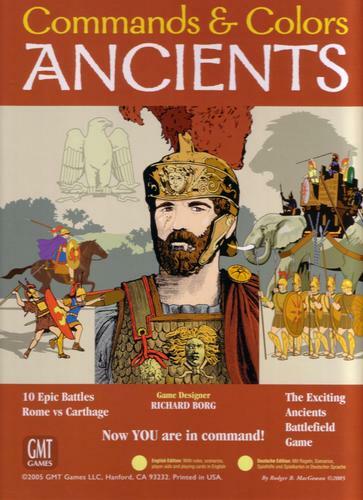 The 13 battles, showcased in the scenario booklet, although stylized, focus on important terrain features and the historical deployment of forces in scale with the game system. The battles include Bagradas, Cannae, and Zama." "The scale of the game fluctuates from battle to battle. For some scenarios, an infantry unit may represent a legion of fighters, while in other scenarios a unit may represent just a few brave warriors. But the tactics you need to execute conform remarkably well to the advantages and limitations inherent to the various units, their weapons, terrain and time." "The command card system, drives movement, creates a true fog of war and presents both challenges and opportunities. There are four types of command cards: Leadership cards, Section cards, Troop cards and Tactic cards. 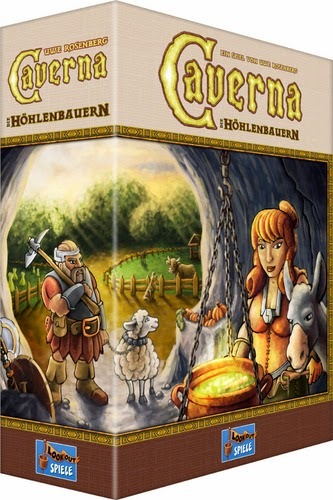 The game mechanics, although simplistic, will still require strategic card play, historical tactics, timely dice rolling, and an aggressive yet flexible battle plan, to achieve victory."